Should I pray about the Book of Mormon? Notice that this verse already presumes that the book is true. Thus if you don't receive a feeling of its truthfulness, your prayer must not have been sincere enough. Feelings based confirmation is the foundation of all Mormon truth. Mormons are discouraged from examining the origins and particulars of their religion, but have no problems scrutinizing the Bible and other Christian denominations. A feelings based criteria provides no way to arbitrate between different groups that claim to receive confirmative feelings about their own religion. 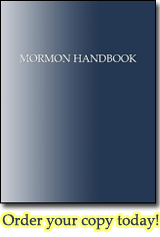 Since many churches consider the Book of Mormon scripture, even if one receives a testimony of the Book of Mormon, it itself provides no direction as to which church to join. Since the Book of Mormon claims to be an authentic historical record—of people, places, things, dates, and events—these underlying facts can and should be examined. Spiritual experiences are subjective and cannot be relied upon exclusively to determine if the Book of Mormon is a work of fact or fiction. Aside from the experiential, the Bible instructs us to study, test and prove what is true. Pisteuo is the Greek word for "believe", such as used in John 3:16, which means: "to think to be true, to be persuaded of, an acknowledgement of fact or event, intellectual faith". We must have good reason that the Book of Mormon is an authentic historical record before we pray about its alleged spiritual truthfulness. Otherwise, is the Book of Mormon true without prayer?